Home Encouraging Do You Hear The Silence? Soul Work is most definitely an individual journey. There may be members of your Tribe that are supporting you, but the truth is, no one will truly understand the depths of what you are releasing. If you are open to the concept of Spirit, then knowing you are being encouraged and carried by the ones you love, in the world of spirit, is very comforting indeed. Receiving help from people in our lives that have passed over, will come in abundance if you embrace the truth of where they are. More often than not, it is just really nice to know that there is love around you, when you need it the most. Soul Work is hard work. The hardest work there is to do on this Earth. The work of the soul will throw you into the depts of darkness, because this is where we tuck away the nastiness of our existence. Soul Work, over time, begins to release this sticky, black and foul tar for the soul purpose of allowing us to find peace. Peace within ourselves. Soul Work is necessary for the elevation of our truth. The journey is long, it may well last a life time. But, with each small step of success, as you release and let go of what no longer serves you, you will come closer to standing in your Authentic Self. The Self of which you were born to recognize and understand. The very essence of your Inner Being, the beautifulness of who you are. There will be people in your life that you want to share this new found joy with. Loved ones, partners, friends and family, you want them to feel the way you do, you want them to feel the love that you feel. Scrapping the tar of your Soul throws you into a whole other dimension of truth, and that truth is unconditional love. But remember, it is not for us to enforce our Will on someone else. Inspire by your actions, your words may mean nothing if they are not ready to face their Souls. 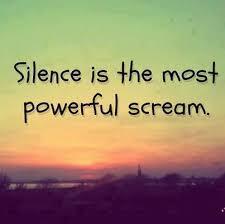 Silence is the loudest scream. Sometimes the sound of nothingness, is what people hear the most.